Make no mistake — this year’s Senate elections are being waged on Republican turf. But that’s not uncommon. A third of all Senate seats are on the ballot every other November, which means that two-thirds of the Senate remains the same even after a federal election (special elections prompted by vacancies can create a bit more turnover). This is in stark contrast to the House, where every member is up for reelection every two years. The Senate “classes” predate the popular election of senators, which was enacted through the ratification of the 17th Amendment in 1913. As we’ve noted before, Democrats have to defend 21 Senate seats this cycle to the Republicans’ 14, and compounding their problems is that in the past four elections, the Democratic presidential candidate received an average of just 46.6% of the two-party presidential vote in the 33 states that have a Class 2 Senate seat, which are the ones up for election this year (the special elections coming up in Hawaii and South Carolina next year are not included because those seats are typically contested as part of different Senate classes). That’s the most Republican-tilting of the three Senate classes. Class 1, the Senate map from last year, is the most Democratic: The Democratic candidate won an average of 50.7% of the two-party vote over the past four presidential elections in the 33 states that had Senate races last year. 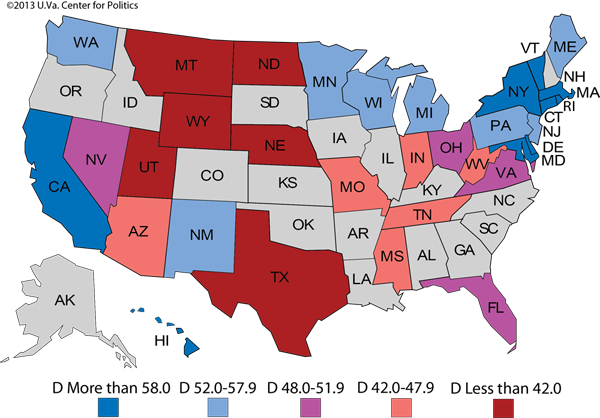 Meanwhile, the Democratic candidate won 48.2% of the two-party vote in 2010’s 34-state Senate map (Class 3), which makes it, on paper, the most purple map of the three. Wait a second, though — most readers know that while the two parties split the past four presidential elections, Barack Obama won by bigger margins than George W. Bush. In fact, the Democratic candidate won 51.2% of the national presidential two-party vote over the past four elections, while Republicans won 48.8%. That’s a better Democratic figure than any of the three Senate classes described above. What gives? Remember that the Senate is not designed to be representative in the way that the House is. Wyoming — which cast about 1 million presidential votes over the past four cycles — gets two Senate seats, just like California, which cast about 50 million. 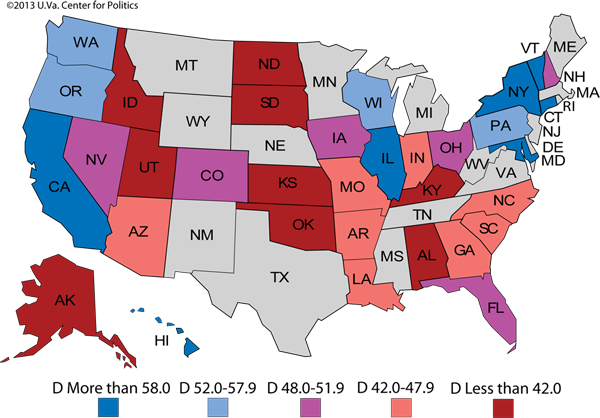 In assessing the partisan lean of the three Senate maps, it makes more sense to treat all states equally, as the Senate itself does. So over the past four elections across all 50 states, the Democratic presidential candidate received just an average of 48.5% of the two-party vote in each state, while the Republican candidate won 51.5%. In that same time period, Democratic presidential candidates won 93 states in the Electoral College, or 46.5% of the 200 possible (Republicans won 107 states in that timeframe). Given that all the states are treated the same in allocating senators, Republicans — all else equal — start with a leg up in the Senate, because Democratic voters are concentrated in fewer states. But all else is rarely equal, and the national political environment and other factors have, at least recently, allowed Democrats to overcome their slight structural disadvantage in the Senate. The following maps show the three Senate classes. They are arranged in order of Senate past (2012, Class 1), present (2014, Class 2) and future (2016, Class 3). For all the maps below, click on the image to expand it. With the exception of Nevada, where Sen. Dean Heller (R) narrowly won his first full term, the Democrats just about maxed out the Class 1 map, which as mentioned above is, on paper, the friendliest Democratic map of the three classes. This map was contested in two strong Democratic years the past two times it was up for election — 2006 and 2012 — which helps explain its lopsided Democratic advantage, but it’s worth noting that Democrats won a net gain of four seats on this map in 2000, perhaps the most “neutral” (read: close) presidential year of many of our lifetimes. What helped Democrats pick up seats in 2000? Well, go back to 1994 — Republicans had a great year, and the 2000 election offered a correction of sorts, as Democrats added seats in four states that have gone Democratic in at least the past six presidential elections: Delaware, Michigan, Minnesota and Washington. If the Democrats somehow keep control of the White House in 2016, this map would be the one contested in the new Democratic president’s first midterm. Given what we know about midterms — the incumbent president’s party typically loses congressional seats — Republicans would be set up for a good cycle even on the most Democratic Senate map, as they could target the handful of seats in Republican-leaning states that are currently held by Democrats. We recently published a full analysis of all the seats being contested under this map, so there’s not much need to elaborate. 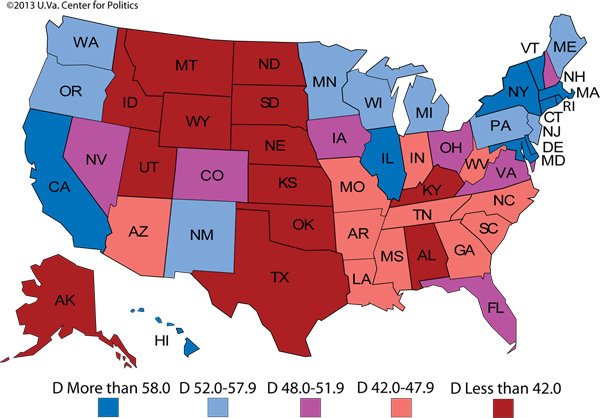 This is a map that’s theoretically very favorable to Republicans, even though Democrats did quite well under it in Obama’s landslide 2008 victory. 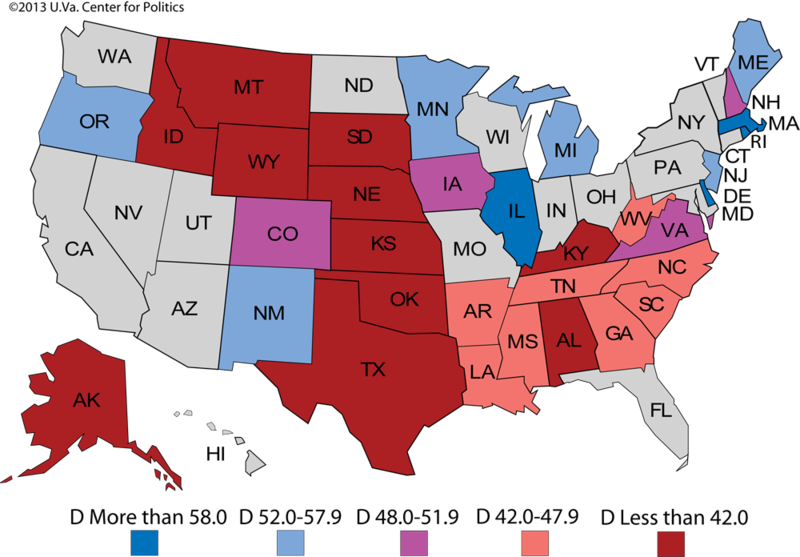 And that’s just the trick: The big-picture political environment can trump the generic, “on paper” Senate map. 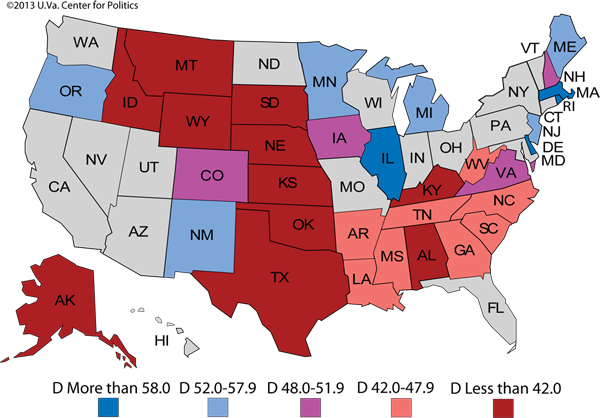 Given that we do not know the overall political environment next year, it’s hard to say just how good this map will end up being for the Republicans, though they obviously have a lot of ripe opportunities in states that have consistently been Republican at the presidential level. 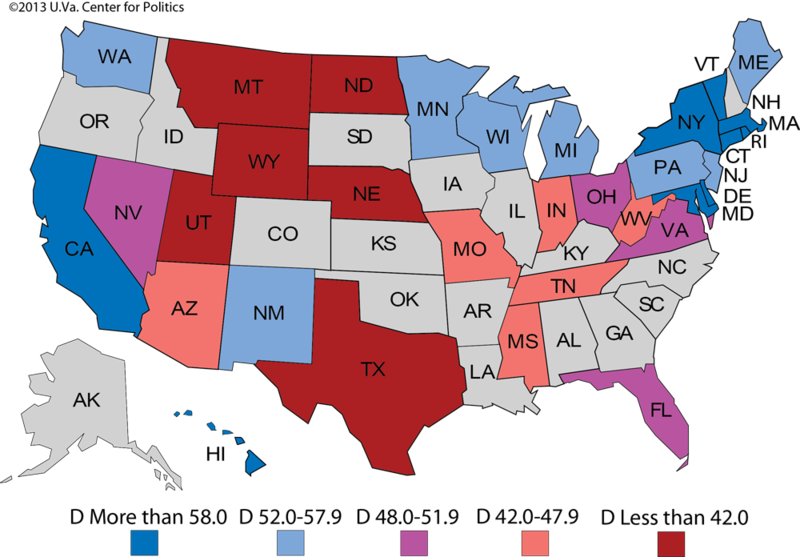 Senate Class 3 is, based on the presidential vote, the most purple of the three Senate maps, but its current composition is heavily Republicans not only because it was last contested during the 2010 Republican wave, but also because — before that — it was fought in the shadow of the 2004 presidential election between Bush and John Kerry. While winning a close but decisive race over Kerry, Bush’s Republicans netted four extra Senate seats in 2004, in addition to the six seats the Republicans gained in November 2010. Republicans will have at least a few targets under this map — perhaps in Colorado and Nevada, which were near misses last time — but Democrats are better positioned to make gains against Republican senators who occupy Democratic-leaning presidential battlegrounds, again depending on the national climate. Democrats control the Senate in part because they have shown a better aptitude in recent years for winning Senate races in states that do not support their party’s presidential candidate. While Republicans hold eight Senate seats in states where the Democratic presidential candidate won a greater average share of the two-party vote than the Republican did over the past four presidential elections, Democrats hold 15 such crossover seats. That seven-seat difference more than accounts for the Democrats’ 55-45 edge in the Senate. And there’s a simpler explanation than that: Every senator currently serving was either appointed or elected or reelected on or after Election Day 2008. The 2008 and 2012 elections were sizable Democratic presidential years; 2010 was a big Republican midterm landslide. Having the national environment in their favor in two of three elections also helps explains why Democrats hold the Senate now. Were there other factors? Sure — Republicans, for instance, have generally done worse recruiting Senate candidates over the past few cycles (although Democrats have had some clunkers too, most notably Alexi Giannoulias in Illinois in 2010 and Shelley Berkley in Nevada in 2012). But the national political environment seems to be more important for success in the Senate than which class is contested in a given election. We leave you with two more maps. 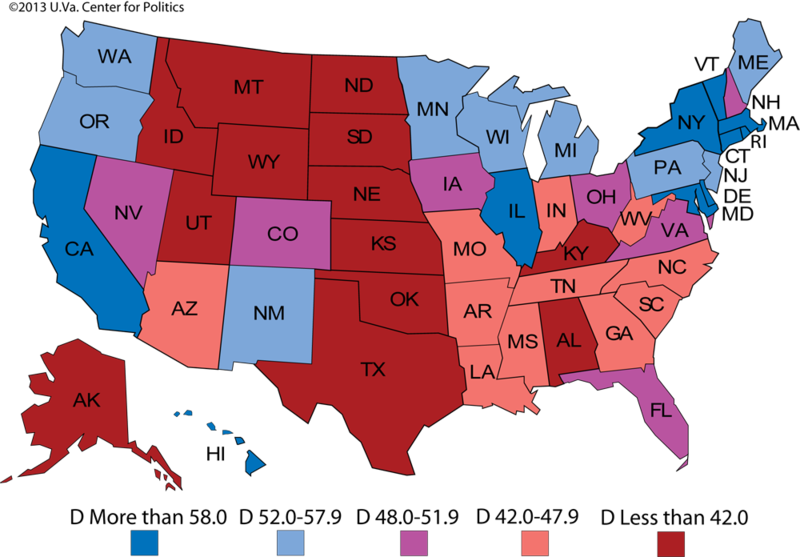 The first, Map 4, shows the average two-party vote in each state over the past four presidential elections. 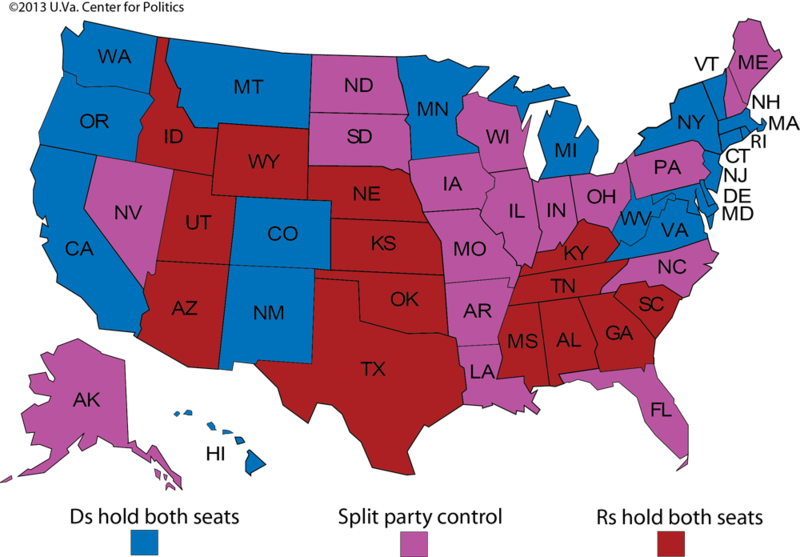 The second, Map 5, shows the state-by-state Senate breakdown. 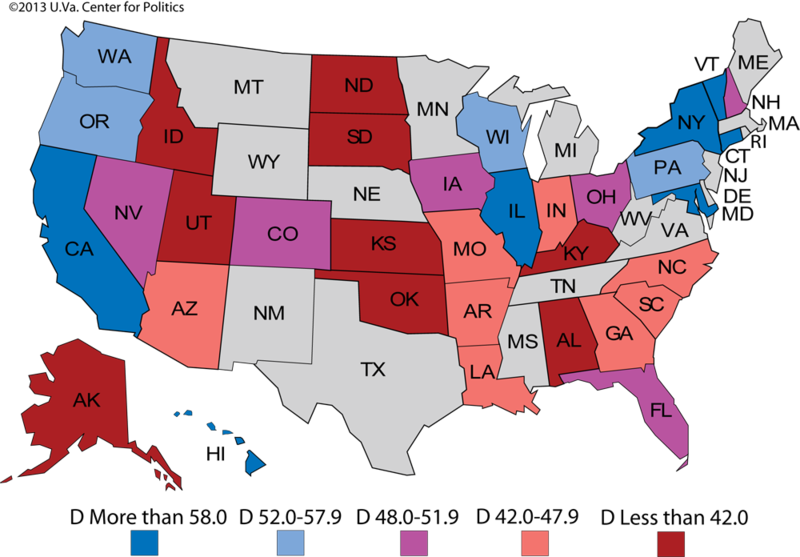 Compare the two; generally speaking, the really Republican presidential states have two Republican senators, the really Democratic states have two Democrats, and the battlegrounds are split, although there are numerous exceptions, and the Democrats generally get the better of those. For instance, there are only two states that have gone for one party in each of the past four presidential elections where, nonetheless, the opposite party holds each of the state’s Senate seats: Montana and West Virginia, which both have two Democratic senators despite giving their electoral votes to Republicans George W. Bush (twice), John McCain and Mitt Romney. It should not be surprising that perhaps the top Republican pickup opportunity in the next election is the seat of retiring Sen. Jay Rockefeller (D-WV), with the seat of Sen. Max Baucus (D-MT) not that far behind. 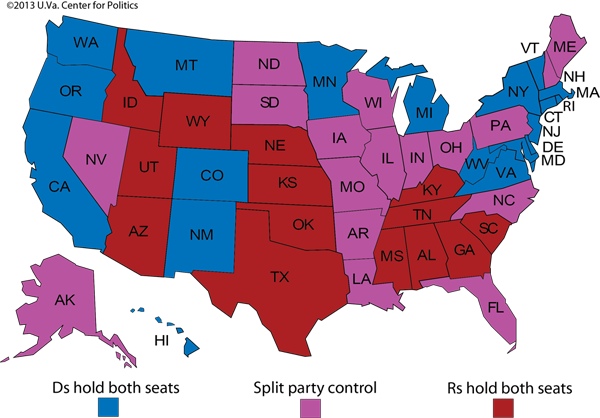 Click here to see an overall chart of state two-party presidential vote percentages.